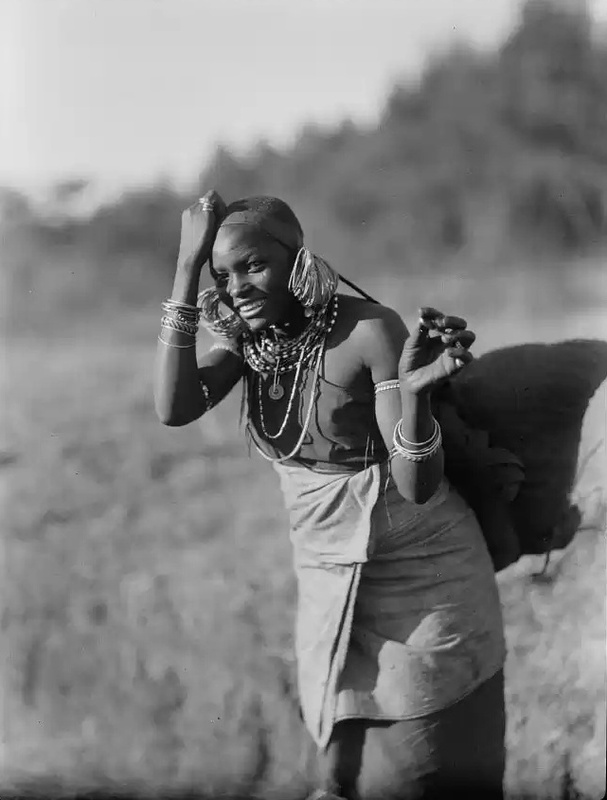 We hereby present three fine antique photographs of Kikuyu women from the three traditional regions of Kikuyuland, Gaki – Nyeri, Metumi – Murang’a, and Kabete – Kiambu. The original photographs are all in the Library of Congress and are catalogued as having belonged to an Eric and Edith Matson taken on a 1936 flight with the Imperial Airways on a World Trunk route following the Nile from the delta to the Victoria Nile and the Victoria Lake. From their collection, it seems like the group visited Nairobi and neighbouring sisal and coffee estates up to Fort Hall, Murang’a and upcountry up to Nanyuki as well as Mombasa and Kisumu. 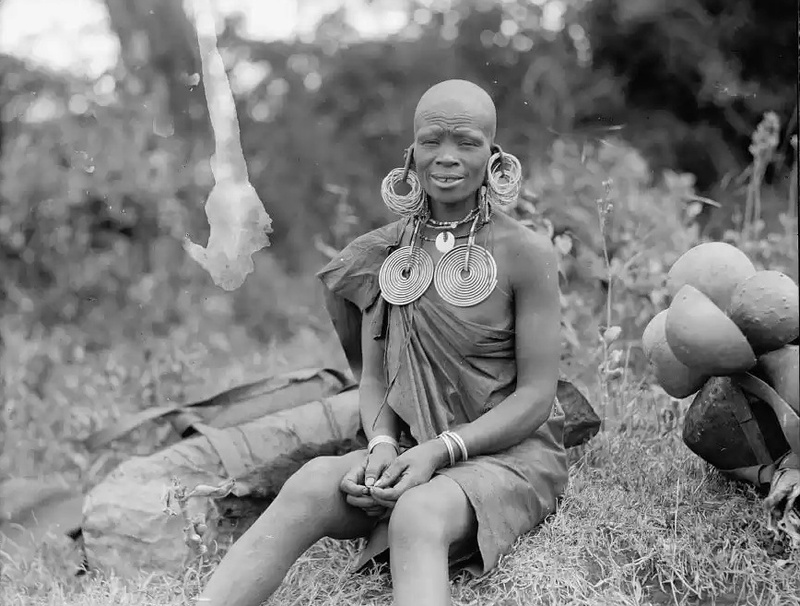 It is while they were between Nairobi and Karatina that they stopped at Fort Hall, then Murang’a where they took the beautiful photo of the Murang’a woman. 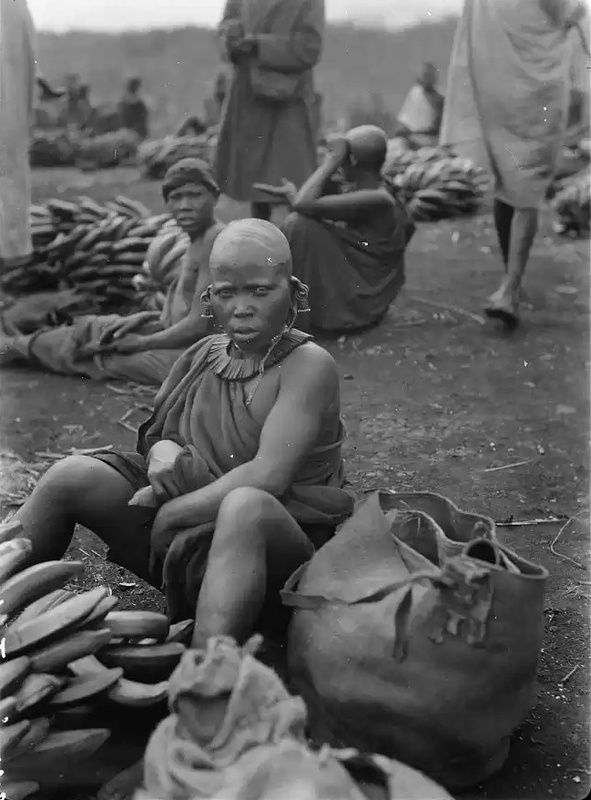 They stopped at Karatina where they took many photos of what they described as a native market under a tree and that is where they took the photograph of the Nyeri woman banana seller. The other photo of the Kiambu woman was taken as “Kikuyu Girl near Nairobi” on their way from Kisumu to Nairobi therefore we may conclude that she was a Kiambu woman. Although it is a very small sample from which to draw conclusions, we can compare the combative unsmiling frown of the Nyeri woman with the comfortable smile and grace of the Murang’a woman. We can compare the Kiambu woman’s radiant smile and open hands with the Muranga closed but unconcealed hands and the Nyeri woman’s hidden hands. In terms of economics it is very clear; the Kiambu woman is the richest followed by the Murang’a and the Nyeri woman, though not poor comes last. All of them engage in commercial activity of one kind or other and it seems again, the Kiambu woman comes tops in terms of riches. The Muranga region was the breadbasket of Kikuyuland and the people were the best farmers of grains. Their stores were the richest and one of the reasons given for Francis Hall to have established a Fort in present day Murang’a town was that it was the best source of food. Kiambu women were more into exchanging articles with Maasai at Dagoreti market and it is apparent that our Kiambu woman has a lot of decorations associated with the Maasai. The true Kikuyu adornments for women can be seen from the Murang’a woman who among the three still retains her leather garments. The Kiambu woman is elegantly dressed in the white calico cloth that was introduced by the whites. Each of these women is of course extremely attractive and it is a toss. Beauty is in the eye of the beholder. This beautiful picture is said to be of an old woman. The photographer seems to have had a better rapport with her and she seems more relaxed. She seems to have been resting and her load is next to her. She is adorned with the traditional beaded ear bangles, hang’i and the two iron spirals worn by married women. Her hang’i however are hanging from the earlobes and not strapped over her head as was the more common practice. In terms of health, again no modern Kikuyu woman can hold a candle to her even those half her age. The flabby arms and overflowing flesh from tummies and waists of today’s woman are not even worth talking about in front of such a physique. This fine picture reveals the beauty of soul of the Kiambu woman. She is a queen and is adorned as one and she knows it. Even if her husband may be poor and all the riches are due to her, no one will ever know it. We give her the name of Njeri aka Waceera, the traveller. Because of her journeys she is exposed to other cultures and trades with them. Her clothing betrays her Aceera clan ancestry, flamboyant, sharp and posh. She is alone as the saying goes, Mũceera ndaceeraga na ũngĩ, or “a Muceera does not travel with another”. Note that she wears rings on her fingers, a mark of royalty, that is, she is not a woman of dirt or grow arrow roots like our Nyeri or Murang’a specimens. Again her health is such that if we cared about our own health, we would do everything to learn the secret behind it and not believe the over glorified white coated prescription clerks for pharmaceutical companies who tell us only what is necessary to increase their business. Quite an interesting read. Keep up with the good job sir! Mwene-Nyaga akurathime ni kugeria gucukia ruui mukaro. We fictionalised the pictures to make the Muranga woman a Wanjiru, the Nyeri woman a Waithiegeni and the Kiambu woman a Waceera or Njeri. The Aceera clan are sharp dressers and not short of vanity. If you see a guy in town driving a Maserati he is likely a Muceera and that was why we noted that the Muceera woman wears rings to show she is not associated with dirt but with travel. Today they are mostly in the diaspora. We never intended it as an insult to the other clans and we apologise if it came out thus. Does it mean that to you that Aacera are only found in Kiambu?If not do the Aacera women in Muranga and Gaki also exhibit the asserted lifestyles? Of cause the Aceera and even all the other clans are distributed in all regions though some regions have more concentrations of particular clans than others. The discussion of characteristics of each clan is a complex one and we are planning on an explanatory text soon. Maaaan, You must be from Kabete! Ati evil? Beautifully evil u say. I like. In all the three instances the women are all hard workers. and the one from kiambu is holding a coin! was she paid for the photo to be taken? maybe. Good observation! Very likely a token of appreciation. Tourists even today do it when they photograph “natives”. Very interesting treatise on the Kikuyu women. I am a Muithiegeni from Wariruta, Karatina. I think the woman from Gakii may be an ancestor. She looks very much like my aunty who incidentally sells foodstuff in Wariruta market. Thanks for sharing! The woman from Nyeri is very industrious she’s selling bananas that she got from her farm meaning she’s fed her whole family and is selling the surplus. The surplus explains her physique that she’s a hardworking woman who ensures her children are well fed and her physique doesn’t mean it’s for wrestling men. Ni githomo kiega muno. Ni ngatho nyingi muno. The usual Nyeri disdain, Rĩu ndũngana ici ikaigania kworota andũ na tũnyamũ tũtũ rĩ, mmmmmh? ungĩmoona!“ hahaha. That cracked me.